Looking for the Coaching videos mentioned in the book? Scroll down on this page to the “Coaching Clips” section below. 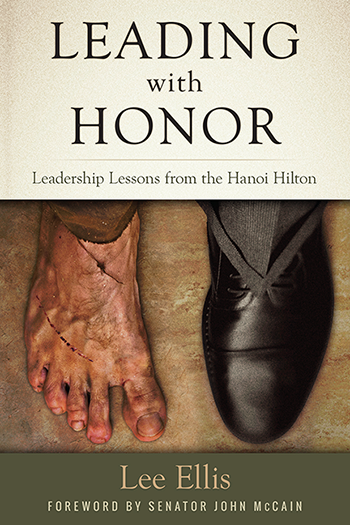 Honor and accountability are linked together as a formula for great leadership. A healthy mindset of accountability can inspire every team and organization to achieve a higher level of performance. The key is engaging with courage, commitment, and caring concern as opposed to motivation by fear, intimidation, and self-preservation. From his early experiences as an Air Force jet fighter pilot and POW in the prison camps of Vietnam to an award-winning author, presenter, and leadership consultant, Lee Ellis shares his concerns about the lack of accountability in our culture and how you can apply a positive, proven accountability model to get better results as a leader. – The connection between positive accountability and honorable behavior. – Gripping personal leadership experiences from the Vietnam POW camps. – A proven model for creating a positive accountability culture. – Practical, step-by-step instructions to help leaders create industry-leading performance and morale. Read more about the Courageous Accountability Model in the Engage with Honor Article Series. Watch Lee’s 10 Coaching Clips that are mentioned in Engage with Honor. Click the link in the top left corner for all clips, or Watch on our YouTube Channel. With every purchase of Engage with Honor from our Online Store, receive the Launch Package with these special features and benefits. – All of the other features listed above. – Bob Littell, Chief NetWeaver – NetWeaving International & The Enrichment Co.
– Larry E. Favreau, CPA, CLU, FLMI, Retired CEO – Southern Farm Bureau Life Insurance Co.
– Jeff Lyash, President & Chief Executive Officer at Ontario Power Generation Inc.
Visit the Online Store for personal and team development products.